Here’s a trail to test your knees! It doesn’t waste much time getting you to the river. Located along the south/west edge of the Auburn State Recreation Area (ASRA), the trail zig-zags down from the NID ditch to the North Fork of the American river. It is part of the Pioneer Express trail. Directions: From the Courthouse, take Auburn-Folsom road 1.5 miles to turn L on Maidu. Go .8 miles and park near the green gate #145 where Maidu goes L, the gate is on your right. The trail starts behind the gate going easy for one third of a mile, dropping steeply as it crosses the ditch, then continuing down to the river to Oregon Bar. 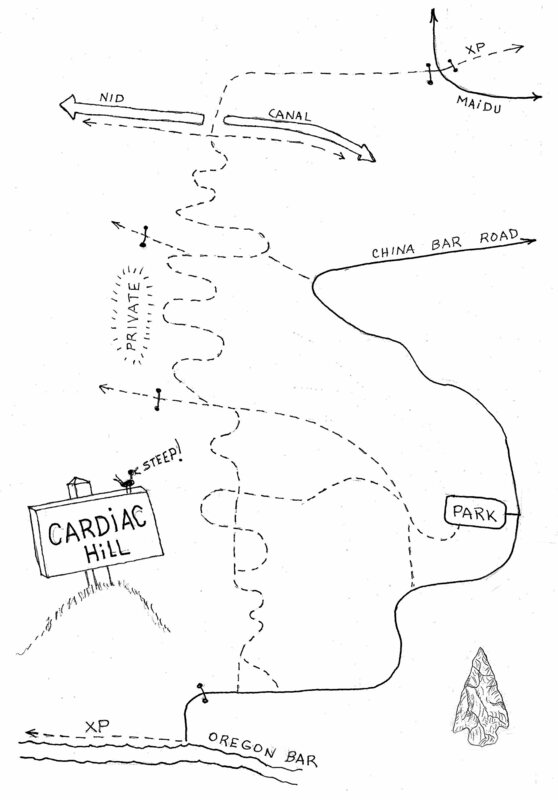 Recent improvements with switchbacks have made the way easier than it used to be, but if its too steep for you take the Cardiac Bypass.